생명체의 유전 정보 복제 과정 중 발생될 수 있는 오류 염기쌍은 체내의 여러 단백질과 DNA의 상호작용을 통해서 자연 복구 된다. 그러나 이런 오류가 제대로 감지되고 복구되지 못하는 경우 돌연변이를 야기하거나, 암세포가 발생되기도 한다. 2015년 노벨 화학상이 DNA 오류 복구 과정에 관한 연구에 수여될 정도로 학계에서도 매우 중요한 문제로 인식되고 있다. 이종봉 교수 연구팀은 이 일련의 복구 과정 중 기존에 규명하지 못했던 오류 염기쌍 인식 후, 오류 염기쌍을 포함한 DNA 가닥의 제거 메커니즘을 오류 염기쌍 제거에 관련된 다양한 단백질들과 DNA간의 복잡한 상호작용을 단일분자 단위로 실시간 관찰하여 밝혀내는데 성공했다. 본 연구 결과는 제 1저자인 전용문 학생과 공동저자인 김대형, 이량근, 오정식 학생의 참여로 3월 7일자 Proceedings of the National Academy Sciences USA (PNAS)에 게재되었다.(doi:10.1073/pnas.1523748113). Mismatch repair (MMR) is activated by evolutionarily conserved MutS homologs (MSH) and MutL homologs (MLH/PMS). MSH recognizes mismatched nucleotides and form extremely stable sliding clamps that may be bound by MLH/PMS to ultimately authorize strand-specific excision starting at a distant 3′- or 5′-DNA scission. The mechanical processes associated with a complete MMR reaction remain enigmatic. 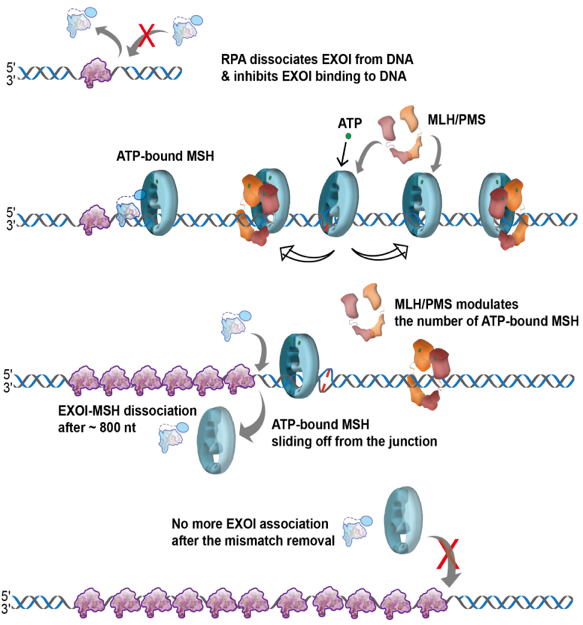 The purified human (Homo sapien or Hs) 5′-MMR excision reaction requires the HsMSH2–HsMSH6 heterodimer, the 5′ → 3′ exonuclease HsEXOI, and the single-stranded binding heterotrimer HsRPA. The HsMLH1–HsPMS2 heterodimer substantially influences 5′-MMR excision in cell extracts but is not required in the purified system. Using real-time single-molecule imaging, we show that HsRPA or Escherichia coli EcSSB restricts HsEXOI excision activity on nicked or gapped DNA. HsMSH2–HsMSH6 activates HsEXOI by overcoming HsRPA/EcSSB inhibition and exploits multiple dynamic sliding clamps to increase tract length. Conversely, HsMLH1–HsPMS2 regulates tract length by controlling the number of excision complexes, providing a link to 5′ MMR.